The Model 034 Epidural Pain Management Training Phantom provides a realistic puncture practice phantom for use with fluoroscopic image guidance. Phantom contains realistic anatomy to facilitate eye / hand coordination in a training environment. 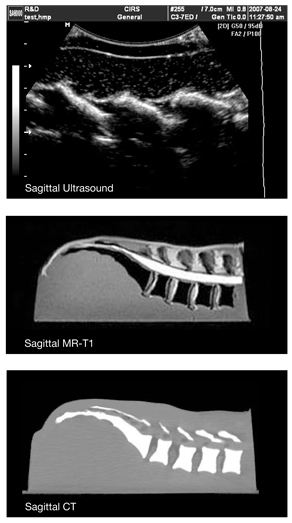 Phantom can also be imaged under CT, MR, and ultrasound. Ligamants, spinal cord, discs,0 skin, and soft tissues have differing softness to permit trainee to "feel" the way to the injection site. 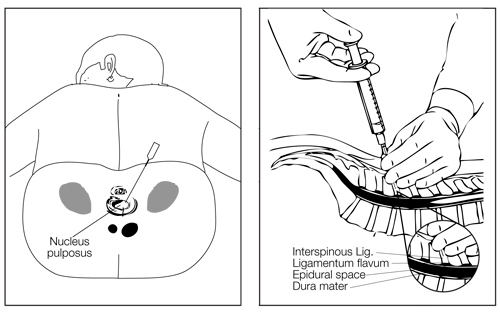 The Model 034 Lumbar Training Phantom provides a realistic puncture practice tool for use with fluoroscopic image guidance. 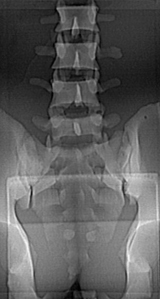 While the shape, size and the various tissues are designed for imaging under fluoroscopic guidance, the phantom capabilities have been also extended to CT, Ultrasound and MR imaging. The realistic anatomy of the phantom facilitates hand-eye coordination. 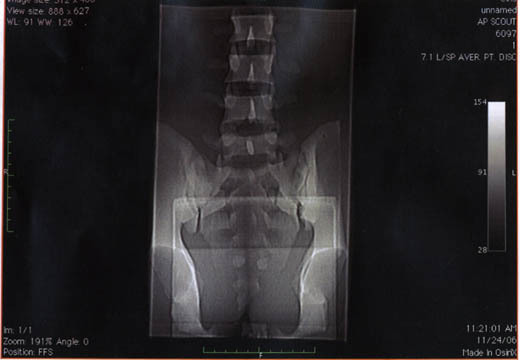 Training for sacroiliac joint injection, lumbar and caudal epidurals, diskograms, block nerves, facet blocks can be implemented. Ligaments, spinal cord, discs, skin and the simulated soft tissue have differing softness to allow trainees to "feel" their way through to the injection. 1. This phantom is a disposable product and is not designed for extended use. It can be reused; however, as with any disposable training device, it will continue to deteriorate with each additional puncture. When not in use, the phantom must be stored in an air-tight container, such as a Ziploc bag to minimize desiccation. 2. This phantom is not intended for palpation. This will damage the phantom. Needle tracks in the gel surrounding bone structure will leave artifacts behind.